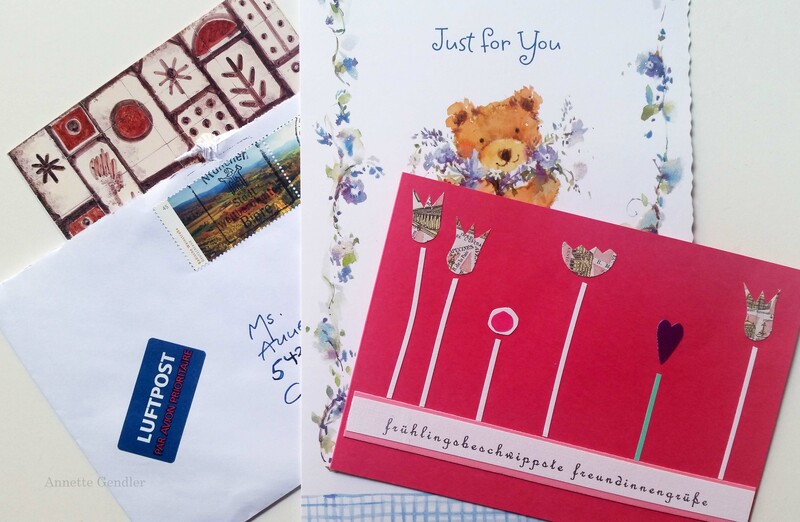 I have blogged before about the special magic of handwritten letters and postcards. But now that I am recovering from hip surgery and have been largely housebound, I discovered just how special it is to receive an actual get well card in the mail. In this age of WhatsApp, texting, email, Facebook posts and messaging, I have received plenty of well wishes. Friends check in regularly to see how I’m doing, but it’s all via the ether. Receiving and replying to an electronic message occupies me for a few minutes, but then the message evaporates. An actual get well card, or (grand luxury!) a handwritten letter, has an entirely different and long-lasting effect. First of all, buying a card, or, as one friend did, creating one, procuring a stamp, and then mailing the card (which also means getting the address, which these days you don’t necessarily have), means someone took the time to do something for me. So when the card arrives at my end, usually by my husband placing it by my bedside (I still have to spend most of my day lying down), it arrives with all that good energy. Anything handwritten is soul-restoring, I have found, especially in the form of well wishes. Handwriting captures the writer’s individuality–our handwriting is all our own; a font isn’t. I read a handwritten card, savor it and afterwards, I leave it out where I continue to see it. Thus it keeps emanating its positive energy. I feel a jolt of joy whenever I spot it. And that’s just what someone like me needs these days: a little joy. Because I do occasionally succumb to moping about, discouraged by how long this recovery is taking. I have always tried to send get well cards whenever I heard someone was sick, but I have often fallen short. So this post is very much a note to myself to do better, to really mail those cards to people in pain. The same goes, by the way, for sympathy cards. agreed! As a card maker, I fully support the idea of people sending actual cards. Keeps small businesses like me going, keeps the postal workers employed as well. Thanks for your comment and I am so happy to meet a card maker! Truly my kind of person! I checked out your Etsy shop, too! Hi Annette, I would like to send you a card, but… I do not have your address. You wrot avery nice essay. I wish you a quick recovery and much patience! So sweet of you, thanks, Jeanne!